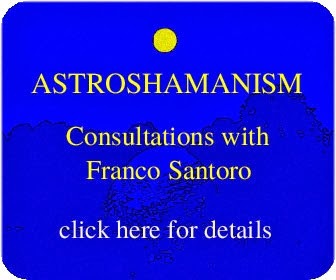 Franco Santoro and his associates offer a wide range of both basic and advanced training courses on holistic awareness, contemporary shamanism, astroshamanism, experiential astrology, spiritual healing, holistic Christianity, astroshamanic trance dance, AstroshamanicHealing. These also include distant learning training module. All our trainings are flexible and adapted to each individual, according to their potentials and needs. We prefer to have an interview or session with each candidate so as to assess together what training format can be more beneficial. We usually suggest to attend an introductory workshop or a series of three individual sessions before committing to a course or a longer training. Trainings may involve individual tuition, group modules and self-study distant learning. This is a flexible formation programme that can be adjusted according to the participants' needs and intentions, including the option of Skype sessions. The basic course is a five-workshop series, starting with a basic introduction and followed by a luminous quest into the mysteries of our multidimensional nature, as represented by the four elements and the 12 zodiac signs. As we meet each sign, we release its secrets and retrieve a fragmented part of our soul, allowing it to activate our highest potentials and become a powerful ally. The programme includes tuition on journeying, divination, trance dance, spirit guides and medicines, release work, time voyages and the astroshamanic zodiac wheel, with practices from many cultures, the European and Mediterranean traditions in particular. 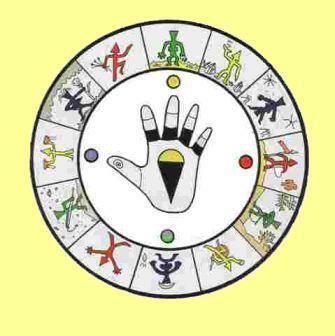 The course provides a basic comprehensive experiential understanding and in-depth knowledge of shamanism and astrology. Each two-day workshop covers a specific theme, including the connection with the Guide, the 12 zodiac signs, the four elements and directions. This series is ideally taken as a whole, yet in some cases workshops may also be attended independently. The course is led by the creator of astroshamanism, Franco Santoro, with the support of the team of Libera Comunità di Terra di Luce, in Corvaro (Rieti, Italy), where the programme takes place. The course also includes three individual consultations, an optional distant learning module and many opportunities for deepening with further courses and workshops. 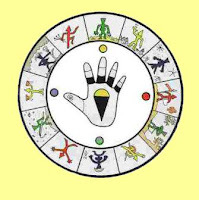 No prior involvement in astrology or shamanism is necessary and total beginners are welcome to apply, though it is expected that some participants will have previous knowledge or experience. An income related pricing applies to the course (five workshops). The intent is to ensure that the course is accessible to people with diverse means. For more detailed information regarding fees and programmes, please contact: info@astroshamanism.org. If you wish to explore distant learning options and Skype sessions, please contact franco@astroshamanism.org. For information contact: Education Dept., Libera Comunità Terra di Luce, via Fuori le Mura, 10, Corvaro, Rieti 02021, tel. 0746306529, 3398331746, info@terradiluce.org info@astroshamanism.org. Admittance to the workshop is preceded by an interview with Franco Santoro, in person or by phone/Skype, aimed at clarifying the participant's intention and defining the programme and curriculum. Please find below some of the workshops included in the Formation Programmes, which the participant can choose according to their curriculum. During this seminar participants are initiated into basic astroshamanic healing and experiential astrology, with particular reference to the relationship with the Spirit Guide, or Core Multidimensional Identity, and the definition of the Intent. The programme includes a complete experiential introduction to the shamanic voyage, the vertical axis, the connection with guides and the search for one’s core potential. The workshop also includes the initiation into the astroshamanic healing Ritual of the Sacred Cone. Since 1988 Franco Santoro has worked extensively with thousands of people from all walks of life and from more than 100 countries, offering them regular support and guidance in the search for their life purpose. Franco is particularly successful in assisting individuals to gain clarity about their highest intentions and develop pragmatic means to fully achieve them. The connection with the inner guide, or multidimensional self, and the enhancement of shamanic healing gifts also plays a significant role. • Deeply and regularly connecting with one’s inner guide, core identity and other deep expressions of the multidimensional self. • Releasing and transforming grievances, blocks and other aspects of separation. • Integrating spiritual, multidimensional and visionary experiences with everyday life, including family, relationships, creativity and work. • Retrieving lost parts of the soul and spirit medicines. • Unveiling, supporting and developing hidden potentials and gifts. • Assisting in devising and applying practices and healing remedies, including a full programme aimed at supporting the above processes. • Providing opportunities for further training and refinement of skills, together with the integration of various forms of astroshamanic tuition, such as specific modules and astroshamanic workshops held at Terra di Luce or other centres, the Operative Training in Astroshamanism, Astroshamanic Practitioner Training or one-year courses, and of other modalities of teaching. The Astroshamanic Mentoring Service is very flexible and can be adapted to all types of situations and needs. We usually work with each person individually for a minimum of three months, and with different pricing options according to what the participant can afford. The service is offered by phone or via Skype, and also through face-to-face sessions, if required. If you would like to receive further information about this service, including costs and format, please contact info@astroshamanism.org. Audio-conference sessions are group sessions delivered via audio-conference calls which support various callers simultaneously. With this technology each participant, regardless of their geographical location, can join in the session, ritual or course, simply connecting with the audio-conference leader and all the other participants at the designated time. Audio-conference classes are used for advanced training, such as the APT, the OTA and some specialised aspects of astroshamamic work. They are also used for beginner and intermediate training. A formation process aimed at training individuals to become proficient astroshamanic practitioners. The APT consists of a general charter (Astroshamanic Intentional Configuration, or AIC) applied to all trainees, and a specialised curriculum based on specific individual talents. The APT includes three independent units: a two-year Foundation Course, a two-year Accreditation Course and a one-year Practice Training with the direct supervision of Franco Santoro.